BEFORE: Day two of baseball mania is a double header. 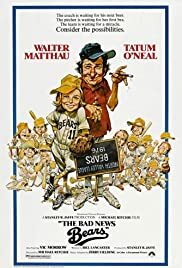 First up is the original, The Bad News Bears (1976) followed by the remake, Bad News Bears (2005) later in the day. From what I’ve heard, the original is supposed to be better, much better, than the remake. Related fun fact: the original grossed $32.32 million and the remake grossed $32.87 but adjusted for inflation, the original trounces the remake at $129.9 million. AFTER: Oh the memories of Little League. So long ago and yet the memories are so clear. Except when I played we didn’t have drunk coaches, racist teammates, or smoking criminals on our team. Even though it’s not very realistic of what an actual Little League team is like (maybe it was like this in the 1970s but I doubt it), it’s still a team you want to root for. A group of ragtag kids, most of whom can hardly catch or hit a ball, is fighting against all odds just for a shot at the championship. Like Seven Psychopaths, there really isn’t a standout performance. The strength of the acting comes in the large ensemble and the chemistry between them. While Coach Buttermaker (Walter Matthau) is the kingpin holding everyone together, without just one of the kids, all sympathy for the team would be lost. One of the hardest things to do, especially in a sports film where you usually cover a whole season that can last weeks or months, is how to convey the passing of time. In The Bad News Bears, they opt for some montage sequences that show the team working their way up the leader-board both winning and losing games. But it doesn’t show what I feel is an important component to the story: the change in the team dynamic. How do the kids improve and why are they better off than they were early on in the season? Sure they added the two strong players who could actually pitch and hit, but the changes feel too sudden. We don’t really get to see how the new members fit in and help the team win other than seeing them continuously strikeout batters and hit home runs. The Bad News Bears is a good film but it’s a great baseball film. The camaraderie and the growth this team makes lends to a good underdog story. But what makes it great is that the focus is on the team and the spirit of winning versus having fun. And just a final note here: I’ve gone through 100 films. It’s hard to believe how far I’ve come in just over three months.